– Ported to Minecraft 1.7.10. – Fuel configs have been removed, but are still generated in the config. – Fixed invalid sound playing when using GravityGun. – Fixed “stuck in floor” bug prevalent in PortalGun for MC1.6.4. It’s called a beta because this port was never meant to happen and was never planned. Work on this port was rushed but although there was some testing done, I cannot guarantee it to be bug-free and I am not going to be supporting the mod until the MC 1.8 version is released, unless it’s a critically breaking bug. I do not want to be wasting any more time on this especially considering the fact that I cannot reuse most of the code for 1.8. PortalGun itself took >13 hours just to port, so that’s just time I’d rather be spending on something else. Right, so, the port is done, I now have every right to say, stop bothering me about it. Shoo. Let me work on 1.8 in peace. Anyways, you can get the mod on here in the usual places or on CurseForge. Oh yeah. Maybe one day we will update our Portal Maps ( http://minecraft.fr/portal-subject-n12021/ & http://minecraft.fr/portal-hall-of-science/ ) ! Actually, this will be perfect for a Gravity Gun Map ! Thanks, and Happy Birthday iChun ! That’s because you’re in creative mode. Portal Guns don’t “nullify” your left-click like they used to. iChun could maybe flag the portal gun like a sword in a future update to make it stop destroying blocks. Alternatively try to shoot from a larger distance. :3 Thank you! Happy birthday by the way! Looks like you’re missing an @SideOnly somewhere! Also, Bacon and Potato Guns’ Colors are just 100% black on my server, but properly colored in singleplayer (possible packet confusion?). Lastly, there isn’t a little portal projectile anymore! It also seems like grabbing blocks with G causes an “Fatal Error” kick from SMP. Happy Birthday to you, iChun! Hope you do best for a 1.8 version! But I won’t rush you on one! It’s my brother’s birthday also! Thanks so much for the update! 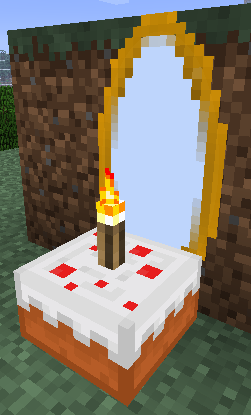 You do realize that the picture shows a cake with a yellow portal and portal 1 ends with chell getting a cake. She doesn’t get it. It just shows the cake. Great job man! Love your mods, you deserve a mega highfive! P.S. Oh, and Happy Birthday! Plz fix Portal 1.7.10, I’m working on a modpack.